While we have been in India for more than three weeks, we have done little in the way of chronicling our trip. A slight accident in the Himalayas has given me the opportunity to do little else. It seems a young boy working as what we might think of as a "flagman" on some of the ubiquitous road work all over India thought it would be a good idea to stop our motorcycles by pulling a rope across the road about 20 feet before we reached him. We were on loose gravel, and my choices were to get "clotheslined" or to lay it down. The construction crew was kind enough to weld the broken bracket on my engine guard, and to sit me on my bike so I could make the 50 mile trip to Rampur where I could get my hip x-rayed. The good news is there is nothing broken, but it is the second day and I am just beginning to be able to put weight on the leg. At least I'll have the chance to bring friends and family up to date, although it may still be some time before we reach somewhere that has internet fast enough to allow us to upload. We began our trip in Delhi on the 15th of August, and were lucky enough to locate a couple of bikes fairly quickly at the motorcycle market in the Karol Bagh neighborhood of Delhi. The dealer, Lalli Singh, is a Sikh gentleman who is fairly well known among foreigners looking for reliable bikes. We purchased one brand new 500 cc Royal Enfield Bullet, and another 2007 with 5000 kilometers on it. The two bikes, with registration, custom luggage racks, one year of insurance, complete service on the used bike, and about 200 bucks worth of spare parts cost us just over $5000, about half of what we would pay for one bike that size in the states. While Lalli outfitted both bikes with the luggage racks to accommodate our bags, we decided to beat it out of Delhi's oppressive heat and traffic and fly up to Srinigar, where we hired a car to take us up to Leh in the Ladahk region of the Himalayas. 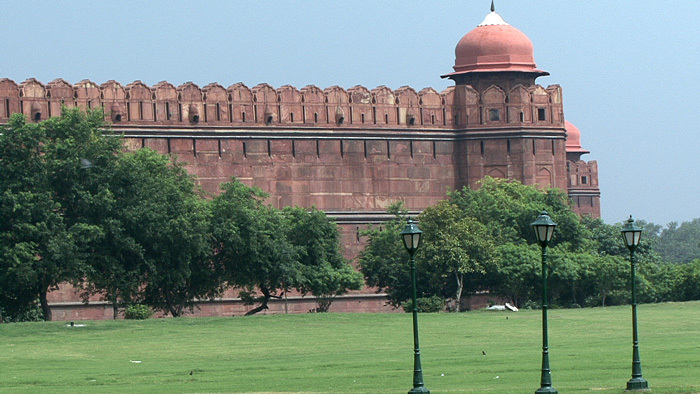 Below are some photos of some of the more popular tourist haunts around Delhi. The Qutb Minar pictured above measures some 50 feet in diameter at its base, and is 73 meters high. 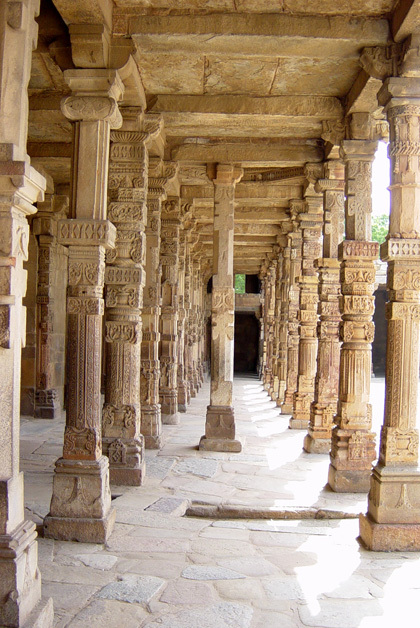 It was built to celebrate the victory of the Muslims over the last of the Hindu kingdoms in Delhi. It was begun in the late 12th century, and took several dynasties before it was completed in 1368. The hall at right is just part of the large complex. 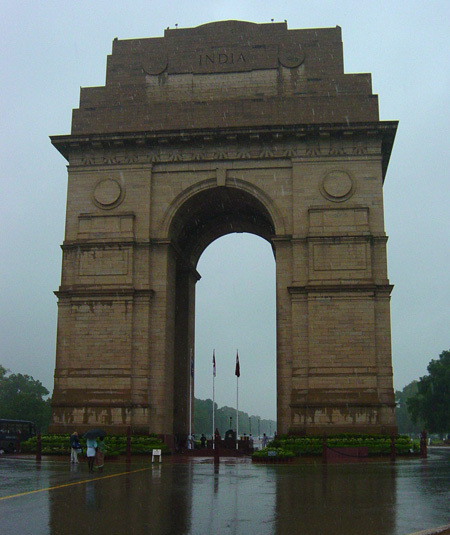 This shot of the India gate was taken during a refreshingly cool morning monsoon. It honors India's veterans of World War I and several other conflicts of that same period, and bears the names of more than 90,000 men who gave their lives.